Costumed superheroes of the kind familiar to generations of American comics readers are an unusual choice for a TV anime series, especially bold considering Tiger & Bunny, which began its 26-episode run in April 2011, isn't based on any established manga or game properties. While Japanese pop culture has its own tradition of costumed heroes battling evil, it centres around live-action (tokusatsu) series such as Kamen Rider and the long-running Super Sentai franchise exported to the West as Power Rangers. All the more commendable, then, for producers Sunrise to take a chance on a risky initiative. The show lays out its premise with ease and flair in the opening episode, as Sternbild City's flashy, corporate-sponsored 'heroes' (just how heroic they are is something the show toys with throughout) compete to take down a group of bank robbers. 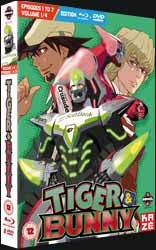 Central character Kotetsu T. Kaburagi, alias Wild Tiger, shows his form at once: with his clumsy tactics and uninspired crimefighting technique, he's unpopular with his sponsors, his TV producer and the audience alike. In an attempt to salvage his popularity Kotetsu's paired up against his will with flashy newcomer Barnaby Brooks Jr., a cool and unfriendly young buck who openly courts popularity and is more concerned with winning hero points than doing good. To the show's credit, Kotetsu isn't automatically painted as the sympathetic party in this setup; his slapdash approach to superheroics often causes trouble for his fellow heroes, and his gung-ho attitude leaves them cold. Barnaby (nicknamed 'Bunny' by Kotetsu thanks to some design elements of his costume, much to his annoyance) is far less likeable, being cynical, aloof and cold to virtually everyone. It's a measure of the creators' confidence, though, that the main characters' appeal takes time to shine through, and by the fifth episode of these seven the riotous comedy surrounding Kotetsu's efforts to help Barnaby celebrate his birthday provides the most enjoyable instalment so far. Veteran director Keiichi Satou (The Big O, Karas) brings great flair to the show's action sequences, with the CGI hero costumes designed by manga artist Masakazu Katsura (Video Girl Ai, Zetman) proving a great visual hook, notably in the case of the supporting characters: the vibrantly - if rather stereotypically - camp Fire Emblem, bruiser Rock Bison and eye-catching pop idol-turned-heroine Blue Rose are instantly memorable. The voice acting on both Japanese and English language tracks is of high quality, though special praise is due to Hiroaki Hirata, best known elsewhere as Sanji in One Piece, whose bluff performance as Kotetsu (and pitch-perfect fumbling of the next episodes' titles during the closing previews) is a delight. With just seven episodes afforded to this opening release, Manga and Kazé have nonetheless given this high-profile series some lavish packaging, and Volume 1 of Tiger & Bunny comes with dual DVD and Blu-ray discs as well as collectors' cards and mini-magazines full of details about Sternbild's heroes. It's a handsome-looking set and hopefully future releases will keep up the level of quality. While Tiger & Bunny isn't quick to reveal its appeal, the comedy, chemistry and lively action on display promise great things for the rest of the series.